Renier designs and builds owner-occupied facilities. More than 500 of them and counting since 1980. There’s a reason our customers become our friends. It’s the way we do business. Building on the foundation of Integrity, every member of the Renier team exemplifies our core values. Tell the truth. Live up to your promises. Admit and fix your mistakes. When the building owner, architect and contractor collaborate from the beginning, you know the cost up front. 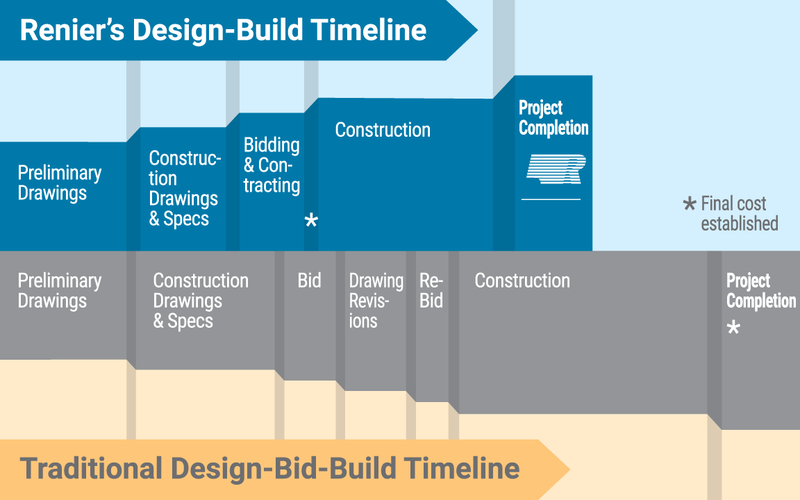 With design-build, change orders are eliminated, the timeline is expedited, and money is saved. Renier acts as the single source of accountability for cost control, delivery, risk reduction, quality, and value. See if design-build is right for you.